Here's a little secret for you: I have never made cupcakes before. Can you believe it? What self-respecting woman of 23 years (almost) has never made cupcakes?! Well, I hope I've made amends now. I finally made some the other day, besides the ones I made with Corey (you know, the ones with cookie dough on the inside?). I'll admit I still had help (from the lovely Mariasha who took the pictures this time), but I made the batter all by myself! Check 'em out! Although the recipe I used is top secret from Mariasha, Here's an equally amazing cupcake recipe that I am pretty excited to try in the next couple of days. 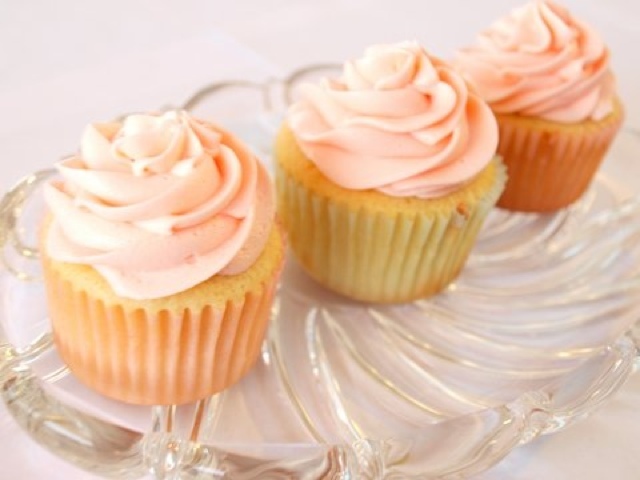 Who knew that making cupcakes can be so easy and so fun?! 1. Separate eggs and allow egg whites to stand at room temperature for 30 minutes (reserve yolks for another use). Meanwhile, line muffin tins with cupcake liners. In medium bowl stir together flour, baking powder, baking soda, and salt. Set aside. 2. Preheat oven to 350 degrees F. In a large mixing bowl beat butter with electric mixer on medium to high for 30 seconds. Add sugar and vanilla, beat until well combined. Add egg whites all at once, beat on medium-high for 3 minutes. Alternately add flour mixture and buttermilk to butter mixture, beating on low after each addition just until combined (batter may look slightly curdled). Divide batter among muffin tins until a little more than half full. 3. Bake in preheated oven until golden brown and/or a wooden toothpick inserted near centers comes out clean. Cool cupcakes entirely before frosting. 1. Whisk together the flour and the milk in a small saucepan and cook, whisking constantly, over medium heat until it starts to thicken. It should look like pudding - you should be able to see the bottom of the pan when you stir it. 2. Press the mixture through a mesh strainer and then let it cool completely to room temperature or chill it in the fridge. It needs to be cooled completely or it will melt the butter and you'll have runny frosting. 3. In an electric stand mixer, beat the butter and the sugar for a minute or two with the whisk attachment until the mixture is well-combined and fluffy. 4. While the mixer is running, add in the thickened milk mixture and the flavoring. Beat for 7 minutes on the highest speed you can without spraying it all over the place. It may look curdled at first, and it may take up to 12 minutes. If you have to beat the frosting longer than 7 minutes, try placing an ice pack on the bowl to keep it cool. 5. 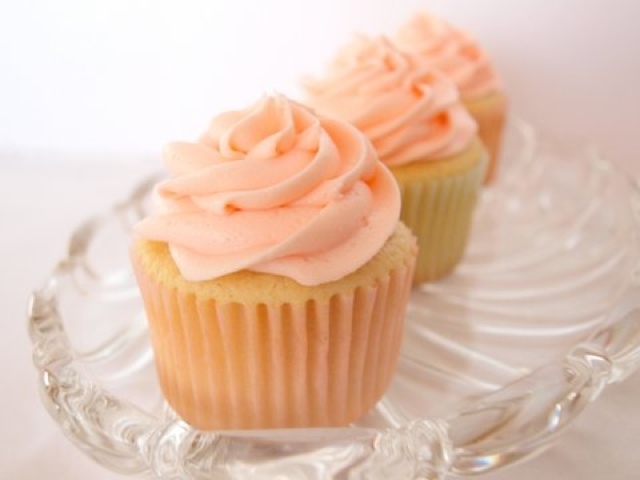 When the frosting is velvety smooth and perfectly fluffy, use it to fill cupcakes or other pastries or as a frosting on top. Give it a try! I know I will! P.S. The Love Week Giveaway is still going on, but you better jump in on it! It'll only be around until Monday! And, as always, may the odds be ever in your favor! I love cupcakes especially if there is cookie dough inside! But these look equally delicious. Yes, like I said, I have yet to try them, but they SOUND delicious and when I do try them, I'll let you know! I just really wish I had all of your talents, my dear. My boyfriend would LOVE if I could bake him or cook him anything. He's the cook around here; not me. Thank you for your sweet email. I am going to try and respond tomorrow. You are such a lovely blogger friend to ask about me. You're amazing, Sue! You are equally talented in what you do, Brani. Besides, if you didn't have a job and were able to stay home taking care of a little one, I'm sure you would find even more talents and improve the ones you already have, just like I have! Thank you!